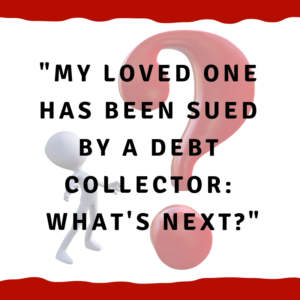 My loved one has been sued by a debt collector: What’s next? Make sure they respond in time . . . so that they do not get a default judgment. This is the first and most important thing for you to help your loved one understand. No matter how bad the case is or how good your defenses are, if you do not respond in time, they will lose. This is like not showing up to the football game — you lose. Even if you are the better team with the better plan. If don’t show up, its a loss. Small Claims Court — 14 days from being served. District Court — 14 days from being served. Circuit Court — 30 days from being served. If a response (typically an “Answer”) is not filed in time, the court will enter a default judgment. This is a real judgment and it allows the debt collector and the collection lawyer to garnish wages or bank accounts. Even force a “sale” of real property such as their home. Solution: answer the lawsuit in time. But often your family will say “I owe the debt so there is no way I can fight this. I’ll just do nothing.” Here’s why this is a bad conclusion. It is natural for a family member to think owing the debt is all that matters. Your loved one was not sued by the original creditor (Capital One, Chase, Synchrony Bank, etc). Instead a debt collector (LVNV, Midland, Portfolio, etc) claims to have bought the debt. Is that the same as proving it? It is one thing to claim to own something but its much different to prove they own it. So even if we “owe” the debt, the question is the collector that sued us — does that company own the debt? If not, then it doesn’t matter if your loved one “owes” the debt. Here’s an illustration — I owe money on my house. No doubt about it. But I don’t owe you, do I? Because you don’t own my mortgage debt. Same thing here — we have defended hundreds and hundreds of these debt collector (debt buyer) lawsuits in Alabama and we have not seen these guys prove they own the debt. Significance: If the collector has to prove it owns the debt, this means your loved one has options on what to do. So what are the options — let’s talk about that next. TWO — fight the lawsuit on their own. THREE — settle the lawsuit on their own. FOUR — hire a lawyer to fight the lawsuit. FIVE — hire a lawyer to settle the lawsuit. First, you don’t file bankruptcy unless no other choice. And for 99% of people sued, they can pick one of the other options. Second, fighting the lawsuit on their own is a choice. It means no help from a lawyer but it also means not having to pay a lawyer. This works best in small claims or district court and you can see an overview of how this happens here. Third, to settle the lawsuit means paying between 50% and 85% of the amount sued for in a lump sum or paying the entire amount over time. The credit report of your loved one will still be impacted and there could be tax consequences to settling the case. Fourth, hiring a lawyer to fight the lawsuit means spending money on a lawyer but you do this with the expectation that the lawyer will help improve the chances of winning in court against the collection lawyer. Fifth, if your loved one hires a lawyer to settle, you want to make sure they know what they are paying for and that it makes sense. Bottom line: if your family member wants help going through these options after being sued by a debt collector, have them call us. They can call and ask for Carolyn — 205-879-2447 — and she can look up their case online. Or fill out our contact form and we’ll get right back with them. No cost or obligation for us to go over their options and the best strategy for them. We look forward to helping your family member deal with this situation.